The Quranic verse 17:28 is mainly about relatives whose bad conduct/behavior drives one to avoid them while seeking the Lord God's mercy, as one will not mistreat them or talk harshly to them. This is the context of the verse you mention: "And give the relative his rights, and the poor, and the wayfarer, and do not squander wastefully. The extravagant are brethren of the devils, and the devil is ever ungrateful to his Lord." (17:26-27). This does not apply to one's parents; we are to care for them and to treat them kindly no matter what and even if their faiths differ from ours. The Lord God says the following in the Quran: "Your Lord has commanded that you worship none but Him, and that you be good to your parents. If either of them or both of them reach old age with you, do not say to them a word of disrespect, nor scold them, but say to them kind words. And lower to them the wing of humility, out of mercy, and say, "My Lord, have mercy on them, as they raised me when I was a child."" (17:23-24); "We have entrusted the human being with the care of his parents. His mother carried him through hardship upon hardship, weaning him in two years. So give thanks to Me, and to your parents. To Me is the destination. But if they strive to have you associate with Me something of which you have no knowledge, do not obey them. But keep them company in this life, in kindness, and follow the path of him who turns to Me. Then to Me is your return; and I will inform you of what you used to do." (31:14-15). Of course not; the real meaning of faith within monotheism is to believe in the Divine Scripture and to apply its commands (performing good deeds and acts of worship while avoiding sins, etc.) while never to deify things (e.g., mausoleums) and mortals (i.e., prophets and non-prophets) at all; this monotheism is part of the belief in the Hereafter; the Lord God is the Only Controller and Sole Owner/Master of the Day of Judgment and He will judge deeds and faiths of human beings; there will be no intercessors/mediators at all. Thus, faith is not deemed good without performing many good deeds; of course, good deeds will be rendered useless and will be nullified if they are not accompanied with monotheism. This is real piety: good faith + many good deeds. Of course, the Quranic verses explain one another; you cannot read/understand any verse (e.g., 57:21) in isolation. Thank you for your concern, our dear son Mr. Ahmad Hosni; we are so sorry for the belated reply to your email messages. In fact, 30 episodes we have videoed were lost because of a virus in our PC. We are re-shooting them these days; our modest means and impecuniousness hinder our endeavors to upload episodes regularly now. Yet, we promise to upload new episodes soon enough after their preparation, shooting, and editing. We implore the Lord God to reward and bless Mr. Fares Qorayyia, from FL, the USA, whose generous donation offered to our VA-based IQC has helped us through this situation. Thank you, our dearest son Mr. Ahmed Fathy. We implore the Lord God to reward you for your voluntary translation of our fatwas, articles, and books and for providing the English subtitles for our YouTube videos. Your contribution to our Quranism website is incomparable and your steadfastness in helping our person is unprecedented. We have to re-video the episodes which were lost and we will shoot new episodes very soon. Rest assured that our son, Mr. Mohamed Mansour, will edit and upload the episodes within our YouTube channel ( https://www.youtube.com/user/ahlalquran1/featured) as soon as possible. May the Lord God come to our help and aid. First of all, we never ask about the faith/religion of those who send questions to us via email messages; we focus only on responding to their questions as soon as we can. We have written a lot about vows and zakat in several fatwas and articles and in our books. We refer you to this article in English titled "Between Fulfillment of Vows and Charity Donations" found on this link on the English section of our website: ( http://www.ahl-alquran.com/English/show_article.php?main_id=18321 ). We have the right to ridicule, undermine, and refute the Sunnite religion and any other polytheistic religions like it (i.e., the Shiite and Sufi ones) which are posing as if they were part of Islam. This is a figure of speech typical of the eloquent style of the Arabic tongue; the "mother" of someone/something is their abode/home or their origin. This means that Hell will engulf or encompass those heedless sinners like the womb of a mother forever inside the Raging Fire; they will never get out of it and will never die or feel any comfort or respite; this is their final destination for eternity. The Lord God says the following in the Quran: "...nor do We ever punish until We have sent a messenger." (17:15). The (messenger) here is the Divine Message/Scripture reaching people. This answers your second question: those who died during childhood will enter Paradise. As for your first question, we do not have a definite answer for it. Away from Sunnite and Sufi myths about the subject, we assert here that the bliss and pleasures of Paradise cannot be imagined with our limited minds, all views/ponderings/reflections on that topic are mere views ascribed to their authors, past and present. We can say here only that immortal youths and immortal houris serving Paradise dwellers are part of rewards to them based on their good deeds and faith during their lifetimes on earth. "Serving them will be youths like hidden pearls." (52:24). Please read and ponder carefully upon the verses 55:52-76. Those youths, we tend to think, may have this Quranic verse applied to them: "... nor do We ever punish until We have sent a messenger." (17:15). Hence, they will enter Paradise, and they might (or might not) be the immortal youths in Paradise mentioned in the Quran as serving drinks for Paradise dwellers. Therepeating style in the Quran is not merely for the purposes of assertion, emphasis, and reminding readers; this is also part of the digital/numerical miraculous features of the Quranic text. Some meanings are repeated in Quranic verses which are not one hundred percent similar but are different in few words only. The Lord God says the following in the Quran: "God cites the example of a man shared by partners at odds, and a man belonging exclusively to one man. Are they equal in status? Praise be to God, but most of them do not know. You will die, and they will die." (39:29-30). Let us quote the entire context here: "An Arabic Quran, without any defect, so they may become pious. God cites the example of a man shared by partners at odds, and a man belonging exclusively to one man. Are they equal in status? Praise be to God, but most of them do not know. You will die, and they will die. Then, on the Day of Resurrection, you will be quarrelling before your Lord." (39:28-31). Of course, defects, discrepancies, and contradictions are countless in the terrestrial religions of the polytheistic Muhammadans; their polytheism is mentioned in the parable in 39:29. As for 39:30-31, they are addressed to Muhammad; he was a mortal prophet and while he was alive, the Lord God has told him he will die like other mortals and so will his enemies/foes and disbelievers in general; both he and they will be judged on the Last Day and allowed to defend themselves. We see in 39:30-31 a miraculous prediction and refutation of the Sunnite mythology revolving around an immortal, deified intercessor, Muhammad, living inside a mausoleum in Yathreb. To die means that souls will enter into a Barsakh level and bodies will decompose and turn into bones and dust. This occurred to all dead prophets/messengers (and Muhammad is no exception to this rule) and to all human beings. This is a Quranic fact and also a natural/scientific fact. Those who deny this Quranic fact are the polytheists who deify Muhammad and deem him as a god beside Allah. The Quranic stories are NEVER a source of religious legislations. Quranic legislations are in verses containing dos and don'ts. You forget also that the Lord God is not to be questioned, in contrast to human beings who will be questioned: "He will not be questioned about what He does, but they will be questioned." (21:23). Human beings are tested during their lifetimes on earth since the descent of Adam and his wife to earth. Part of this test is that some human beings are enemies of some others; this is because most human beings succumb to the whispers and temptations of devils and a minority of human beings follow the Divine Guidance/Book. The winners who pass the test are those who adhere to the Divine Message; losers are those who misguide themselves and turn away from the Divine Scripture. The Lord God says the following in the Quran: "We will attend to you, O prominent two. So which of your Lord's marvels will you deny?" (55:31-32); this is an indication of the Day of Judgment when human beings and jinn will be judged so that the winners will enter into Paradise for eternity and the sinners/losers will enter into Hell for eternity. Our greetings to you and to all Quranists in Iran. May the Lord God bless and protect all Quranists in Iran. Within Quranic dos and don'ts, the Quranic legislations have three spheres: (1) legislative commands which are governed by (2) legislative rules that aim at achieving (3) legislative purposes. Another three orbits or spheres of Islamic legislation in the Quran are as follows: (1) commands, obligations, or duties, (2) prohibited items, and 3) what is lawful, allowed, and permissible. The methodology of the Quran is to specify meticulously nos. (1) and (2), while never mentioning items of no. (3). Hence, anything that is not mentioned as prohibited in the Quran is permissible of course. If past divine legislations, before the advent of Islam, used to prohibit something but the Quran allows it as permissible, the item is mentioned as something permitted within a new legislations.Yet, the Sunnite religion of Satan has changed, added, prohibited, and allowed items in a bizarre way; its authors have made orbits or spheres of legislation as five by dividing no. (3) (i.e., what is lawful, allowed, and permissible by being not mentioned in the Quranic text) into two degrees/spheres: the hated items and the desired items. For the Sunnite scholars past and present, the hated items are things allowed and permissible but should be avoided, but they are lesser in degree than the outright prohibited items; as for the desired items, they are permissible items that ought to be followed or done, but they are lesser in degree than the outright religious duty or obligation. Such Sunnite additions by introducing new sharia notions or spheres, never endorsed by God in the Quran are deemed as violation of the Quranic sharia. Hence, there is nothing in the Quranic sharia legislations as hated/loved or desired aspects within prohibitions and commands. There is no required arrangement; you can wash up the body parts mentioned in 5:6 in any arrangement you like. Yes; taking a shower/bath makes you require no ablution at all before prayers. The alcohol amount (because of fermentation or converting alcohol into acetic acid) that is used within the process of making vinegar is negligible. There are traces of alcohol in several types of vinegar but in very small amounts which will not cause drunkenness. Thus, it is not prohibited to consume these types of vinegar. If any other beverages contain alcohol and they cause drunkenness, it is prohibited to consume them. In 16:67, the term (Sakaran) means sugar contained in, and extracted from, certain fruits. The terms (Sokara) and (Sakarat) here mean heedless and heedlessness in these two verses, respectively: "O you who believe! Do not approach the prayer while you are heedless/Sokara, so that you know what you say..." (4:43); "By your life, they were blundering in their heedlessness/Sakarat." (15:72). The terms (Sokara) and (Sakarat) here refer to loss of consciousness in these two verses: "The daze/Sakarat of death has come in truth..." (50:19); this is about the day of the Resurrection: "On the Day...and you will see the people fainting/Sokara, even though they are not fainted/Sokara - but the torment of God is severe." (22:2). You are wrong and mistaken; wine is never intended in 16:67 because consumption of wine is prohibited in the Quran and wine is described as abomination of Satan (see 5:90). Besides, you forget that Quranic/Islamic legislations (i.e., commands and prohibitions) are NEVER derived from the Quranic stories. The context of 16:67 is about bounties of the Lord God bestowed on human beings; e.g., water and milk in 16:66 and honey in 16:69. This term means the pious ones; the Arabic root Kh/B/T refers to piety, reverence, and submission to God here: "As for those who believe and do good deeds, and submit/Akhbato themselves to their Lord - these are the inhabitants of Paradise, where they will abide forever." (11:23); "And so that those endowed with knowledge may know that it is the Truth from your Lord, and so believe in it, and their hearts soften/Tokhbet to it. God guides those who believe to a Straight Path." (22:54);"...and announce good news to the pious ones/Mokhbiteen. Those whose hearts tremble when God is mentioned, and those who endure what has befallen them, and those who perform the prayer and spend from what We have provided for them." (22:34-35). Another meaning of this root is to lessen, subside, and abate: "...Their abode is Hell; whenever it abates/Khabat, We intensify the blaze for them." (17:97). 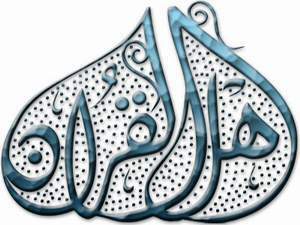 Within the Quranic/Arabic style of eloquence, the singular form of a word is sometimes used in order to indicate the plural form as well. This is why you find the singular form (Sacred Month) employed in, e.g., 5:2, 5:97, and 2:217, and the plural form (Sacred Months) is employed in, e.g., 2:197 and 9:5. Of course, refuting this silly balderdash of Sufis is very easy. Firstly, as per the Quran, Muhammad never knew the future to talk about it; he never uttered this silly hadith fabricated by Sufis centuries after Muhammad's death. Secondly, no one enters into Paradise or Hell before the Day of Judgment. The Omniscient Lord God is the Only One Who has the right to talk about the Hereafter (and the future in this world and the next one) within the Quranic verses. Thirdly, the Lord God never changes His Words/Decrees; no Hell-dwellers will get out of it: "The decree from Me will not be changed, and I am not unjust to the servants." On the Day when We will say to Hell, "Are you full?" And it will say, "Are there any more?"" (50:29-30). Lastly, friends in this world will be enemies cursing one another inside Hell (before and after entering into it) if they deserve entering into it; in contrast, Paradise dwellers will be close friends even if enmity existed among them in the transient world, as they were pious enough to be admitted into Paradise: "On that Day, friends will be enemies of one another, except for the pious ones." (43:67); "We will remove whatever rancor is in their hearts. Rivers will flow beneath them. And they will say, "Praise be to God, who has guided us to this. Had God not guided us, we would never be guided. The messengers of our Lord did come with the truth." And it will be proclaimed to them, "This is Paradise you are made to inherit, on account of what you used to do."" (7:43); "But the pious ones will be in gardens with springs. "Enter it in peace and security." And We will remove all ill-feelings from their hearts - brothers and sisters, on couches facing one another." (15:45-47); "..."You have chosen idols instead of God, out of affection for one another in the worldly life. But then, on the Day of Resurrection, you will disown one another, and curse one another. Your destiny is Hell, and you will have no saviors."" (29:25).